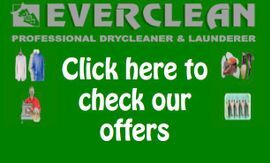 Welcome to Everclean the professional dry-cleaning and laundry experts. Enjoy a professional standard of cleaning by bringing your garments to us to take care of. Whether its your suits that need cleaning or your trousers that need shortening we can take handle it all. Our friendly staff are always on hand to give you advice, and make sure your every requirement is taken care of as best as possible. So why not relax and let us take care of your cleaning needs. With your garments being handled with the utmost care by Evercleans experienced and professional staff you wont have to worry about anything. Contact us now or come and visit us in Golders Green for more information.